Last month I decided to do the Whole 30. What is the Whole 30, you ask? During the Whole 30 you are to stay away from diary, sugar, and grains, and consume healthy meats, vegetables, fruits, nuts, and fats. It lasts for 30 days (which you probably figured out already). It has been an eye opening experience, to say the least. I went into it knowing many of my food issues, and have had them confirmed. I’ve also found that some were much bigger issues than I thought. Why am I doing the Whole 30? I started out keeping a food journal, but have since dropped it. I just don’t like thinking about food that much. But, maybe I will pick it back up again. We will see. The first week was difficult. The cravings for grains and sugar were quite strong. I was also surprised at how often I went to put something in my mouth throughout the day. Snacking is discouraged on the program. And I was not hungry, just had a snacking habit! A snacking habit is hard to break! Especially if you’ve been at it for years. After the initial difficulties, I started to feel more energetic, less bloated, and quite content with my food choices. My favorite part has been increasing my consumption of vegetables! There are so many different varieties of vegetables to try and an amazing amount of ways to prepare them. Something about having a fridge full of them is comforting. It feels like the way life should be! I’ve enjoyed some really tasty meals, like Chicken and Cabbage stir fry (so easy and so good). Last week, I found myself slipping into some old habits as my stress level was high. I had to prepare tax papers and it was much harder without chocolate! Sad, but true. I found myself snacking on dates and nuts more than I needed to. I didn’t feel as good as I had the previous week. For this reason I am going to extend my Whole 30. The Whole 30 program was designed by the folks at Whole9life.com. They have a host of resources available to anyone who desires to follow the program, included meal planning guides, the entire program outlined, and a forum. All free. 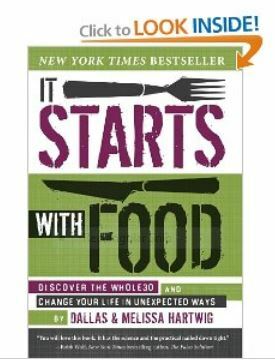 I also highly recommend the book, It Starts with Food, by Dallas and Mellisa Hartwig (the creators of Whole 30). It is an eye-opening, well-researched treatise on food and health. A life changer, really. I’m nervously committing to journaling my food this week and sharing the details with you next week. Would you like to see that? I’m also committing to no date and nut snacks! There’s nothing wrong with dates and nuts, but I’m turning to them instead of other options and finding that I eat them as a replacement for sweet treats. So, for those reasons, I want to stay away for this week and see how I do. Have you tried the Whole30? If not, does it look like something you’d like to do? I’ve been hearing more and more about Whole30, so now I’m considering it. Probably more for my hubby (!) but that means I would need to do it, too! I’m sure it would benefit us, but I’m a little worried about the impact on the food budget. We’d have to cut back in other areas, I’m sure.